Eliza is an orphan. She lives with her mother, two brothers & one sister in a small house that was built by her father before he passed away. Their mother has a low income job, only earning approximately £35 per month. Eliza received her food packet from Muslim Aid Indonesia which consisted of rice, cooking oil, date, milk and many more items, from her sponsor in the UK. 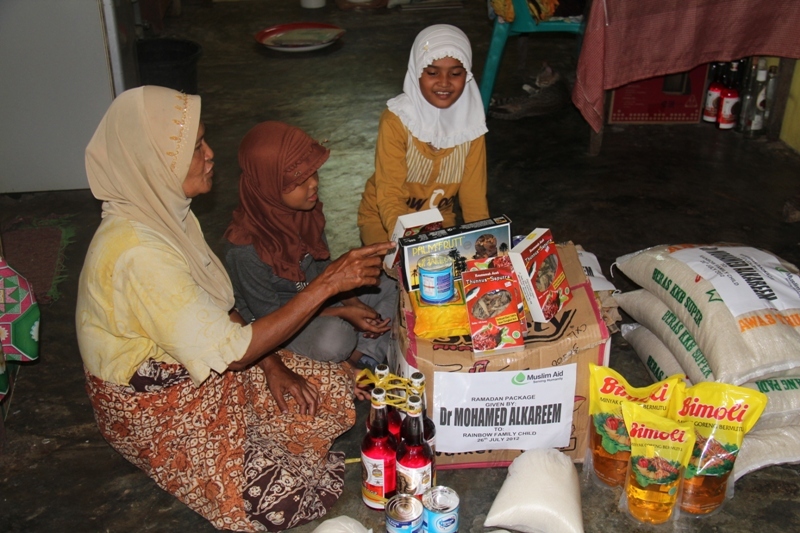 When Muslim Aid Indonesia (MAI) team visited her with the food packet, she was very happy and enthusiast to open the box to see what was inside it. Eliza is one of Muslim Aid Rainbow Family Children. She is currently studying at grade 5 of Elementary school. 80 year old Tom Pheas is a widow, who lives with her 5 grandchildren in a small house in Toul village of Kampong Chhnang province. She was very happy to receive the Ramadan food package from Muslim Aid. She said “This food will support my whole family for 10 days. I’m happy that Muslim Aid enlisted my name for the food package. I never ate canned fish such as these and never saw so many items at the same time in my house, such as sugar, fish, packets of noodles, cans of milk, dates along with 15 rice”. 28 years old Hamza Nifras lives with his parents in Slave Island Colombo 02. He has two sisters and one brother. They live in a small rented hut which doesn’t even have the basic necessities such as a toilet or full working water system. Nifras has a job with a very low income. His father sells porridge in the pavement and earns a meager income. This is just enough to fulfill a part of their needs. Sabit is a 70 year old man who lives alone. During the conflicts in Bosnia he was wounded several times which left many shrapnels in his legs and arms. Sabit is a civilian victim of the conflict with 60% disability. He lives under very difficult conditions and Ramadan Food Parcel mean a lot to him. Sabit told Muslim Aid Bosnia staff that this parcel will make his life easier at least during Ramadan as this donation means a lot to him. "If I had got a kilograms of sugar I would have been very satisfied, let alone this much food. This food parcel will last for the whole month of Ramadan. You have surprised me and left me speechless. I am lost for words." Sabit's happy face said it all. As Sabit is unable to walk well, Muslim Aid dropped Sabit at his modest home without a roof and promised to be in touch with him before Eid to help him further.